How do you get nearly 100 local residents to participate in your community forum? Through working hard on marketing, Hometown Collaboration Initiative (HCI) co-coach Beth Neu explained. Neu is one of the coaches for the Angola HCI team. She was joined by several Purdue University and Ball State University professionals who served as table facilitators. The Angola HCI team was diligent in getting the word out about the forum, targeting media outlets such as newspapers, social media, and even getting an interview on the local radio with Angola HCI co-coach Crystal Van-Pelt, a Purdue Extension educator in Steuben County. 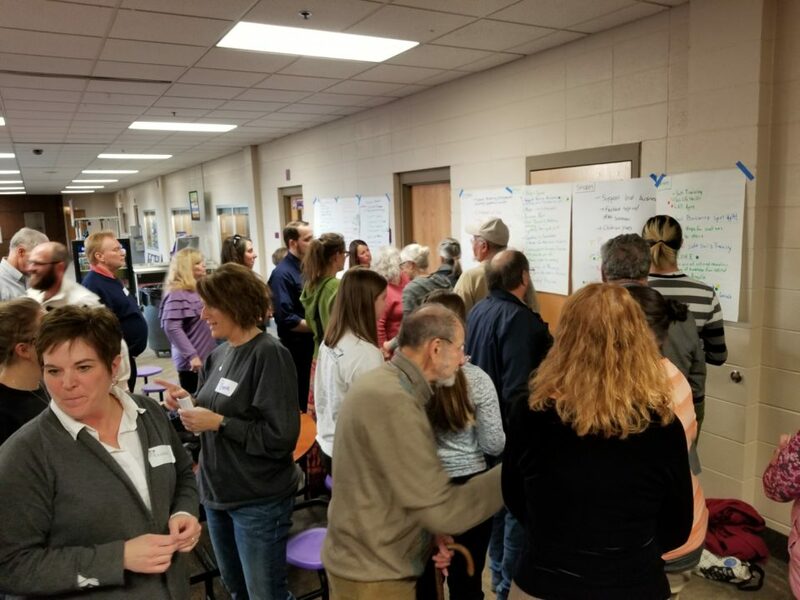 The end result is that the forum held at the Angola High School attracted a high energy group of local residents who demonstrated their passion and commitment to making Angola an even greater place to live, work and recreate. The forum opened with remarks from Angola’s mayor, Richard M. Hickman. The event was then facilitated by Bridget Harrison, part of the Angola HCI team. There were some things that set this HCI event apart from previously held HCI forums in various parts of Indiana. First, the team chose to offer childcare during the forum with pre-planned activities for the kids. Second, the event attracted a diversity of people, including students from Trine University and the Angola High School, community leaders, retirees, and people of prime working age. Angola HCI’s survey, which conducted a few weeks prior to the event, was completed by nearly 1,000 people, with 31% of the respondents being youth under 18 years of age. The forum, coupled with the results of the completed survey, provided the opportunity for a wide range of viewpoints to be heard.